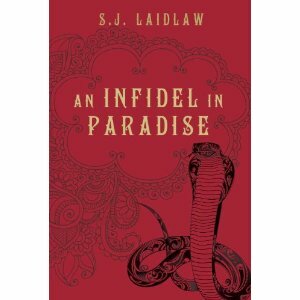 This is a really exciting time for the MiGs because Susan Laidlaw’s cover for INFIDEL IN PARADISE was released! We are all plastering her cover everywhere because we’re so thrilled for her. Isn’t it awesome? I love it’s exotic flair and the lovely designs. If you’re interested in more details on Susan, you can check her out on her agency’s website here. Susan has also agreed to do an interview on my blog so more on that soon. Add it to your Goodreads to read list! 5 Responses to Susan Laidlaw’s Exotic Cover! I love the deep red of the cover. Very eyecatching! Congrats to Susan! It sounds fascinating and I love the cover. Thanks for sharing this. Sounds good! I love the swirly designs on the cover, too.